Suzanne holds a master’s degree in occupational therapy from the University of Minnesota and bachelor of science degrees in both exercise science and sociology with a minor in psychology from NDSU. Suzy has over six years of experience in a variety of settings, including a pediatric outpatient clinic, early intervention, and in multiple school settings working with children in grades preK-8. 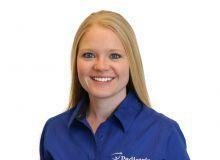 She has experience working with a variety of diagnoses and is certified in Handwriting Without Tears. Building independence and confidence in her patients is an important focus for Suzy as she works alongside children and their families to participate in and improve their daily activities and routines.